The chamber is actively dedicated to CSR, particularly youth unemployment, and that is something which Jill is glad to be part of. For more information on the Council nominations process and timeline, please follow this link. If you’re interested but want to know more about being a Council member, or standing for President, contact Glenn for an informal discussion. 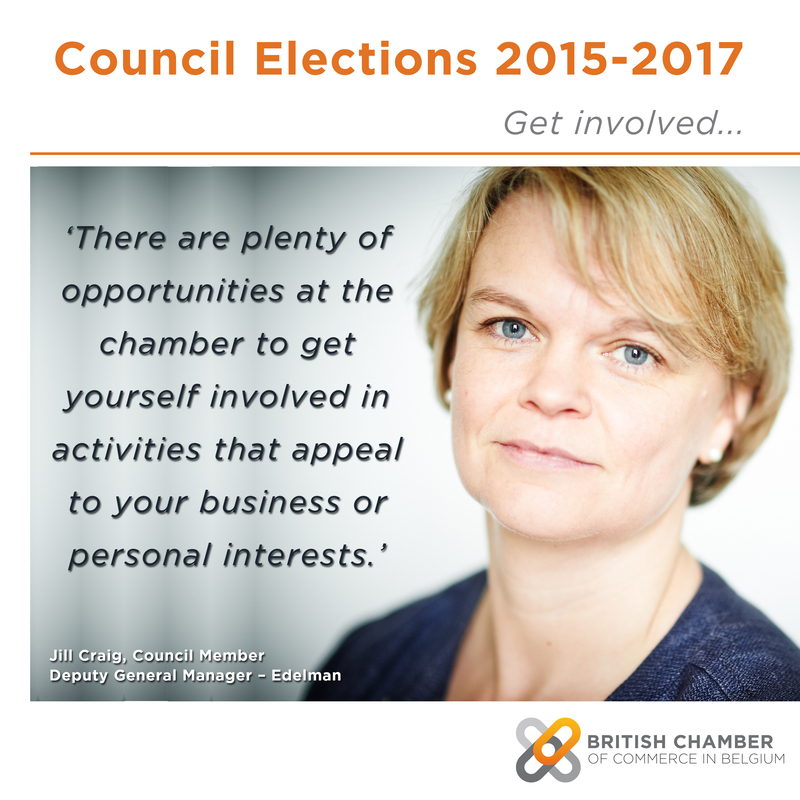 Nomination forms must be filled in and sent to glenn@britishchamber.be by 24 April 2015. I first started at the chamber several jobs ago, around 1998, as part of a company who was already a member of the chamber. I quickly became a member of the EU committee and was on Council for two terms. I got involved because I wanted to be better networked and to contribute to helping the chamber move to a more professional model. I left my first job for another, but this company was not a member of the chamber and didn’t plan on being so I had to take a break away from the chamber. I then joined again 3 years ago when I brought Edelman into the Chamber. As I got more involved, I was really pleased to see how much progress had been made in the time I had been away. The chamber is now a professional outfit, with leadership, a clear strategy and an energetic team. The chamber, since my time away, has found its feet and is an organisation that I was more than happy to showcase to Edelman and push them to join as a member. I am now back on Council and happy that I can help the chamber achieve its mission. A strand of the chamber of which I am glad to be a part of, is the CSR group (that’s “Chamber Social Responsibility) to which I was invited by Sean Murray. This is such an important part of the chamber because it demonstrates that business is a vital part of its community in a focused, active and productive manner. We have decided to focus on youth unemployment specifically and have introduced a load of initiatives and partnerships to ensure that we achieve our mission and goals. The British Chamber offers much value to me and my company. The chamber has strong business networking opportunities and is a great place to make connections and forge relationships. The chamber is also important to me as a public affairs consultant because of its EU committee. As an EU-focused business, the chamber’s events, task force briefings, Committee breakfasts and lunches are an excellent way to meet a plethora of leading policy makers. Here you can understand a specific policy in more depth, meet policy makers at an informal level, introduce them to clients, and it is also a great platform for junior staff to network and to understand the mechanics of policy. There are plenty of opportunities at the chamber to get yourself involved in activities that appeal to your business or personal interests.